Electroluminescent lighting is achieved by using an EL lamp which is a piece of plastic material coated with a phosphorous material. When a high voltage of 40V or greater is applied across this material and reversed, it will emit light. As long period of DC voltage will reduce the lifetime of EL lamp, the ideal signal to drive it is using a high voltage sine wave. 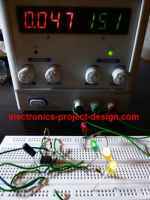 In the past, this is achieved by using discrete components such as transistors, resistors, capacitors, transformers and inductors. In recent years, single chip integrated circuit (IC) driver has been developed where only a few exponents are added to enable it to drive ELD (electroluminescent display) lamp. The use of electroluminescent lighting is generally in the area of backlighting. It is used as backlit for liquid crystal display (LCD), keypads illumination, watches, handheld remote control appliances, thermostats, clocks, calculators and mobile phones amongst others. The advantage of EL is that it consumes very little power compared to LEDs. As such, it is used mostly in handheld devices where batteries are used to power up the device. It is usually used to illuminate displays or keypads in the dark for a momentary period of time. It also light up an area evenly and looks good compared to LEDs. The colors of EL lamp varies and the common ones are greenish and bluish depending on the materials that are selected. The amount of light emitted from the EL lamp depends on the voltage and the frequency that are applied to it. As the voltage and frequency increase, the light output from the lamp will also increase. However, one must take note of the maximum voltage and frequency that are to be used or else the lifetime of the lamp will be reduced significantly. As most handheld devices are battery operated, there is a need to convert the DC voltage from as low as 1.5V DC to 160V peak to peak AC voltage before it is able to drive the ELD lamp. These EL lamp drivers are able to convert the 1.5V DC input and output a 160V peak to peak voltage using a few external components. These drivers usually consume low standby current. The latest EL driver from Supertex is a inductorless EL lamp driver which can drive EL lamps up to 1.5 square inch from voltage input range of 2.4V to 5.0V DC.